Buy Eat Real Lentil Chips with Sea Salt 113g in the UK from our online shop or directly from our independent Scottish store. Delicious crisps free from gluten, dairy and egg. As official Eat Real stockist, we sell genuine Savoury Snacks directly from our shop in Scotland and online throughout the UK. Eat Real snacks, fruit and nut bars are based on three very simple concepts that are Taste, Nutrition and Real Ingredients. Made from real, natural ingredients with no added nasties (artificial flavourings, colourings and preservatives). View more products from Eat Real. Where can you buy real Eat Real Lentil + Salt safely online? If you are wondering where you can buy Eat Real Lentil Chips with Sea Salt 113g safely online in the UK, then shop with us. We are an actual health foods shop; with real people selling real foods and products. Our award-winning independent shop is located in Stirling, Scotland since 1976. You can buy our Snacks, fruit and nut bars and other genuine Savoury Snacks in store or safely place an order with us online or over the phone. 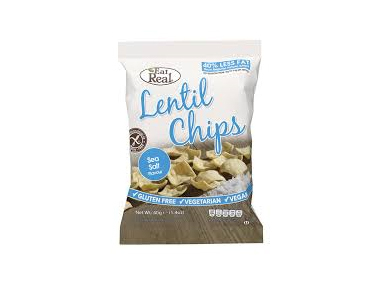 Eat Real Lentil + Salt - Eat Real Lentil Chips with Sea Salt 113g in Savoury Snacks and Foods.